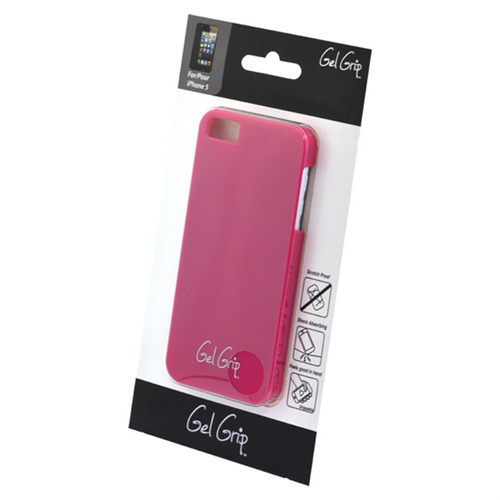 iPhone 5S&nbsp;Pink&nbsp;GelGrip&nbsp;Shell Come out of your shell… by putting one on your phone! Now you can rest assured that your phone is both stylish and well protected with our innovative Gel Grip –Shell Series, available for various devices. Our line-up will make you want to purchase one for every day of the week! These shells come in a plethora of colours which can vastly change the appearance of your phone in an instant. From simple to shimmering- we ensure every preference is considered. These shells combine both style and protection with their super shock absorption power. They can protect your device from accidental drops of up to 2 meters and keeps away dust, scratches and smudges- all without the weight of other shell type cases! Highlighted Features Include:&nbsp; ·&nbsp;&nbsp;&nbsp;&nbsp;&nbsp;&nbsp;&nbsp;&nbsp; Durable and flexible material ·&nbsp;&nbsp;&nbsp;&nbsp;&nbsp;&nbsp;&nbsp;&nbsp; Shock Absorbent ·&nbsp;&nbsp;&nbsp;&nbsp;&nbsp;&nbsp;&nbsp;&nbsp; Scratch Resistant ·&nbsp;&nbsp;&nbsp;&nbsp;&nbsp;&nbsp;&nbsp;&nbsp; Form-Fitting ·&nbsp;&nbsp;&nbsp;&nbsp;&nbsp;&nbsp;&nbsp;&nbsp; Great In-Hand Grip &nbsp; -- Libratel Inc.
Come out of your shell… by putting one on your phone! Now you can rest assured that your phone is both stylish and well protected with our innovative Gel Grip –Shell Series, available for various devices. Our line-up will make you want to purchase one for every day of the week! These shells come in a plethora of colours which can vastly change the appearance of your phone in an instant. From simple to shimmering- we ensure every preference is considered. These shells combine both style and protection with their super shock absorption power. They can protect your device from accidental drops of up to 2 meters and keeps away dust, scratches and smudges- all without the weight of other shell type cases! Coque dure avec prise en gel pour le iPhone 5. Grâce aux nombreuses couleurs variées proposées, ces pellicules adhésives peuvent être harmonisées avec tout vêtement que vous portez. Protège votre appareil contre les chocs et les bosses. Facile à retirer et à brancher, sans danger pour votre téléphone.